Lionel heads north in search of a warmer climate, but not everything goes to plan. View of Hinchinbrook Island, Qld. I’m not going to get into an endless and rather pointless discussion about climate change. But I thought I’d mention that I’m in Far North Queensland at the moment and the daytime temperature is in the low to mid 20s. I look at the Bureau of Meteorology forecast for my home near Stawell, Vic, and gloat when I see the cold, wet, windy weather I’ve left behind for a few months. I left home on my around-Oz trip on May 29 and headed off for my first overnighter at the Hay Weir. It’s a lovely free camp on the banks of the Murrumbidgee, the river flowing past a nice, flat, dry camping spot. Paradise! It poured with rain during the night and the lovely firm ground had turned into clinging black mud and with every step I took I became taller as it stuck to the bottom of my shoes. Yemmy spun his wheels a bit before we reached firmer ground. After a lovely stopover with my friends, Leighton and Pauline at the Peak Hill Caravan Park, NSW, I intended reaching Brewarrina for the night but after only 100km I saw I was coming into Trangie. The Trangie Caravan Park, NSW, has received a lot of good reports from ACC members who have stayed there so I rang editor Max and asked if he’d like a story. When Max said yes I went to the park to be met at the gate by the friendly owner, Andrew, and was shown to a lovely, spacious site quite close to the ablutions and camp kitchen. The one thing that impressed me most was that they have a place for self-contained RVs for just $11 a night – and they can join in happy hour around the fire. It’s ideal for those who enjoy the safety of parking in a caravan park but don’t need all the bells and whistles. It was quite cool at night so I opted for a powered site so that I could use my electric heater! I’d heard about people with dual wheels having trouble on gravel roads when rocks can jam between the tyres and eventually rub through and cause blowouts. I stayed in the Clermont Caravan Park, Qld, overnight after driving a few hundred kilometres on gravel roads but it wasn’t until I’d driven about 100km on the Peak Downs Highway when suddenly Yemmy decided to dance! I managed to pull up on the wide verge and couldn’t believe my eyes when I saw the state of the tyre – it was completely destroyed! It turned out that both tyres had blown at once – no wonder we did a bit of a wiggle! Lionel’s motorhome, Yemmy, all set up. My progress north came to a halt as the tilt truck took me to Moranbah where I waited from Monday until Friday for two new tyres to arrive. I’d fitted six new tyres before setting off so I thought I’d be good for the trip. I was parked on a vacant block behind some buildings with no power or even telly because they have vertical polarity in Moranbah and my antenna is only horizontal so I was pleased when the RACV agreed to pay for me to stay in a nearby motel. It had TV and a lovely shower but no means of heating food, so I spent the evenings and night there and went back to Yemmy during the day where I could cook meals. The tyres arrived Friday having been delivered to the wrong address the day before and I was soon underway for a lovely week at Lake Rhinestone, where the sun shone all day and the solar panels kept me in power. 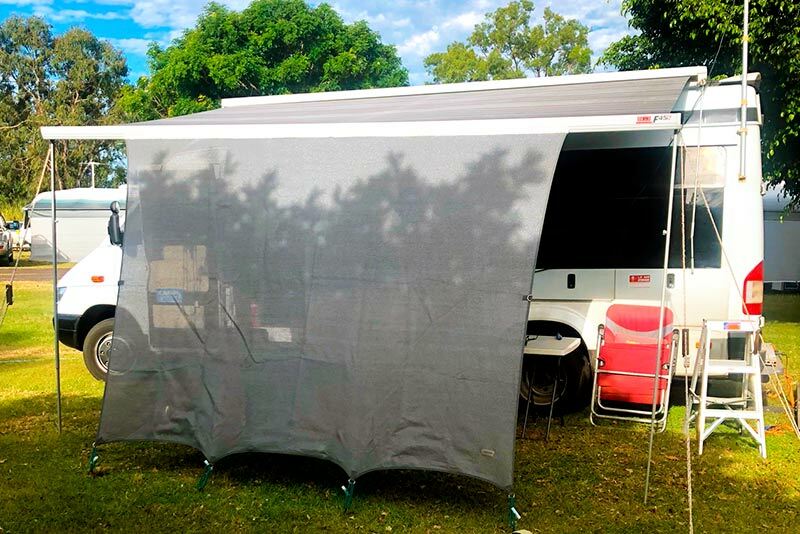 There’s a lovely, new, free RV camping area next to the sports oval in Collinsville, Qld. It’s within walking distance from the shops and there’s lots of room. I was running short of water so took the opportunity to fill up there before heading to the bakery for lunch. On the way to Bowen, Qld, I came to a T intersection with this sign. The road to Belliando Junction was unsealed but would have been quicker. However, I’m a bit wary of gravel since the tyres episode so opted for Bowen and the sealed road. I was going to stay for two nights at Henrietta Creek in the Wooroonooran National Park but I’d booked into a very shady site and needed sun for my solar, although with no phone or internet coverage I wasn’t using much power. It’s a lovely spot and I walked to the creek crossing and to the platypus pool and took a couple of photos. However, Walkamin called and I decided to forget the second night I’d paid for (only $6.70) and move on the next day. A lovely drive through beautiful, green, hilly countryside took me to Atherton where I caught up with shopping, including a pair of shorts – the only thing I hadn’t remembered to pack. Enjoying the fire at the caravan park in Walkamin, Qld. When I arrived at Walkamin I hadn’t even got out of Yemmy before two old friends of many Walkamin stays came to say welcome and chat. Happy hour that night and there were heaps more people welcoming me back. As usual there was a roaring fire to sit around in the evening. I decided to stay for six weeks and leave the day after Christmas in July. Last year, 90 people sat down in the ‘shed’ for a feast of turkey and all the yuletide trimmings. I’ll still be here when I write the next ‘Wallaby’ but Alice Springs is my next major stop when I leave. My eldest daughter and her partner are working in the Big4 there and I try to catch up with them at least once a year.